As we have written above that to accomplish all the trekkings in Tibet, we must drive or fly from Kathmandu to Tibetan land first. 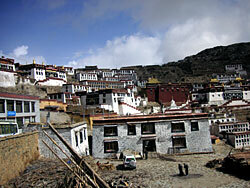 Hence this trip begins with drive through the Friendship Highway to Lhasa or directly flight. As far you have chosen to drive from Kathmandu along the friendship highway, we'll stop in the major towns/settlements enroute. Paying the visits of Sakya, Tashilumpo, Palcho Monasteries and Khumbum Stupa, the first step of drive takes 5 days to reach in Lhasa. Then we'll spend three days in Lhasa for acclimatization and sightseeing tours that covers the visit of the spiritual centers of Tibet: the Jokhang Temple, Sera and Drepung monasteries & the Potala Palace. The next 5 days we will spend in trekking section which begins a 45 km drive to Ganden from Lhasa, we visit the monastery, one of the main Gelugpa sect of Buddhism. This five days trek crosses 2 over 5000m passes enroute and the total trekking distance is 80 KM. This trek has a perfect combination of elevation, moisture and aspect. Upon arriving in Samye, we visit the the monastery-the only monastery that represents Nyingmapa sect of Buddhism (red capped).